Roy Ananda's current work centers on speculative, process-based sculptural practice. His objects and installations reflect on the very act of making, yet are far from introspective. Rather, they lurch forth with the larger-than-life physicality of cartoons, slapstick and swashbuckling adventure. In addition to these on-going, frequently large-scale works, the artist continues to generate a body of more discreet drawings and objects that pay homage to his pop culture influences. Roy states, "the qualities I strive for in my work: something daft, playful, lovingly made and idiosyncratically human". 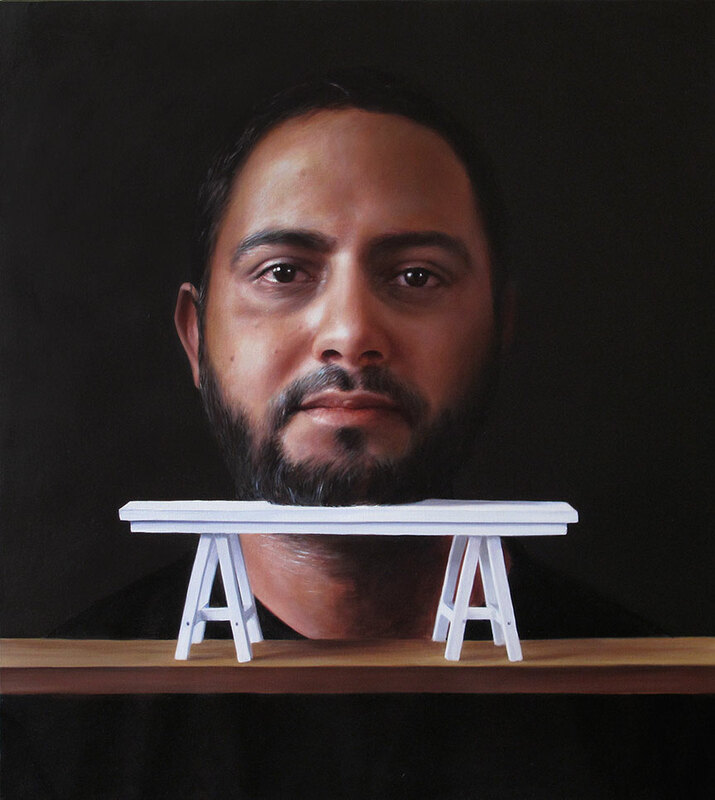 In addition to his studio practice, Roy is also active as a writer and a lecturer; he is currently Head of Sculpture at Adelaide Central School of Art. Roy is a friend and fellow artist whom I've known for many years. We met when we were both attending Adelaide Central School of Art and went on to share studio space for five years. Roy's space would at times seem to become an entire installation in itself as he frequently made large-scale sculptural works. Roy's recent series of smaller-scale works 'chin supports' compelled me to create a series of paintings of him employing one of them. The particular 'chin support' I used in this painting spoke to me not only of studio furniture such as the trestle table but on a more personal level about the many forms of support systems we need in life, not only physical structures but emotional ones as well … 'supports' that keep your chin up would be wonderful to have at your fingertips whilst journeying through life and maintaining an art practice.